I have downloaded Appium Studio Community version. This looks magnificent !!! What does upto 2* means in Android studio community version? Does it mean only 2 sessions, 2 runs? Can we use appium studio community version for billable projects?? ‘upto 2’ means that you can have 2 users testing the same application. So if you work on a project that have up to 2 users you don’t need to worry about licensing. If you have 3 users testing the same application, you will need to work with the professional option. So 90% of the projects can work with the community edition freely. Yes, you can use appium studio community version for billable projects! ‘Offshore capabilities’ means that you can connect to Experitest public cloud (cloud.experitest.com) but you cannot work with onsite clouds. Thanks guy airoli for the quick response. 3.‘Offshore capabilities’ means that you can connect to Experitest public cloud (cloud.experitest.com) but you cannot work with onsite clouds. We have SeeTest onsite cloud here - what version will work with that? I have few questions related to licensing of Appium Studio. –2 users testing the same application means, can i have another set of 2 users testing different applications? does it in any way mean only 2 machines in the entire company can have appium studio. Appium profession and enterprise cost is 100 and 300 dollars per machine. But it is also mentioned as 5 and unlimited respectively . What is ‘per machine’ and what is ‘5’ here. Can we Import Project on to different Machine and run the scripts ? Thanks you in Advance !!! 2 Users means 2 machines. 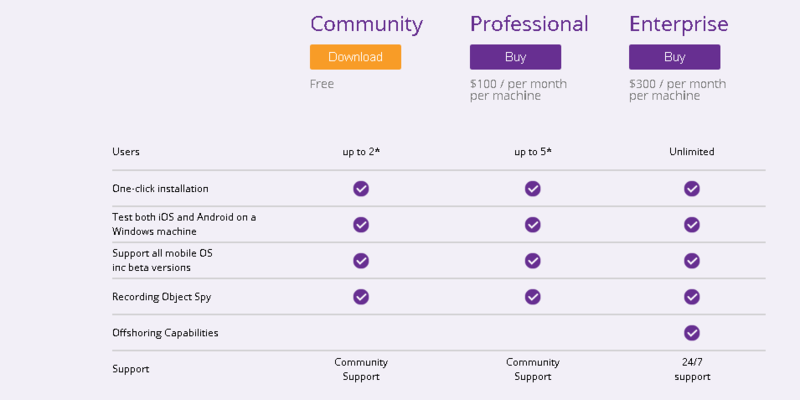 Have a few questions on usage of the Appium Studio free Community Edition available online. Can someone please provide clarity on the below? Does community edition license allow us to connect two iOS devices on one machine and run automation test? Can we have multiple setups of the same, for e.g 2 users testing one application and 2 others testing other application? If I connect 2 ios devices (some combo of simulator and physical) and they both participate in the same test (they are talking to one another), does this count as 2 users from a license perspective ? I am not able to find any information about Licensing/T&C for community Edition. As,We are trying to evaluate different Mobile Automation Tools to provide automation services to our clients. In the process, we have come across Appium Studio which can help us for our specific needs and would like to evaluate the same. We have gone through the details of different plans available and could see that the community edition version is a free version for 2 users and would like to evaluate the same. We had already dropped a mail regarding this on Support@experitest.com but they told us to post Appium Studio Questions here on this forum. Can you please help us with the terms and conditions, if any for the free version so that we can take this up with our legal team before downloading the trial version. We want to use more two computers (one for programming test and another to run them) with AppiumStudio in two different LAN’s. Is it possible? Thanks Tom, I should talk to them about this. I have installed free version of appium studio and running it on single machine even after that it is asking for lisence. How to solve this issue. Am using Appium Studio Community Edition and need to understand the licensing restriction/condition of up to 2 licenses. 1)User1 & User2 using the App-A in Appium Studio. When User3 try to test, he will get the licensing error. 2)But if User2 close the Appium Studio session, Can User3 will able to work now?